Arguably the greatest courtroom drama of all doesn’t take place in a courtroom, but in the juror’s room. 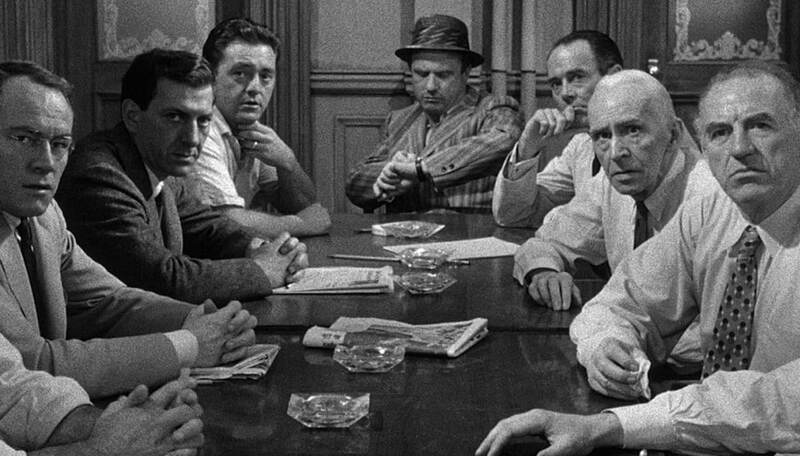 Reginald Rose’s Twelve Angry Men was originally written as a teleplay for CBS and first broadcast in 1954. It follows the deliberations of a trial jury, as one dissenting juror seeks to convince the others that there is some reasonable doubt in what seems an open and shut murder case. The big screen version, directed by Sidney Lumet, appeared in 1957. By this time, all the characters had been given more detail and depth. Joseph Sweeney and George Voskovec reprise their roles as jurors #9 and #11 respectively, while Henry Fonda’s Juror #8 is noticeably more confident than the original portrayal by Robert Cummings. The film is like an influence manual, with every character employing a wide range of ‘push’ and ‘pull’ styles to put forward his point, to listen to arguments, to win over allies, to undermine enemies or simply to manage or avoid conflict. Just like any critical situation, each character brings his own agenda and influence style to the table. Each has his own priorities, his own blocks and emotional baggage, which at times spill over into prejudice and racism, aggression, snobbery or simple laziness. The latter is perhaps best illustrated by Jack Warden’s character, whose priority is not justice, but that a decision is made quickly so he can get to the ballgame on time. The point is that if you’re interested in the ways we seek to influence each other, courtroom dramas can offer a petri dish of behaviour. There’s bombastic rhetoric, impassioned pleading, imploring, proposing and persuading, logic and reason, asserting to defendant, witness, judge and jury. There’s push and pull influence aimed upwards, downwards and sideways – from the judge, who wields all the positional power, to the defendant, who has none. And thanks to the rigid structure of court, every player gets their moment in the spotlight. So, with all that in mind, we’ve picked some of our favourite examples of courtroom influence as portrayed on screen. And happily there’s some 12 Angry Men in there too. Dustin Hoffman discloses many faults as he fights for custody of his son. An apple metaphor is the clincher as James Stewart begs for a key overrule. Maximilian Schell argues that the world, not Germany alone, must take responsibility for Hitler’s rise to power. Gregory Peck ends his powerful closing statement with a direct order to the jury. Tim Matheson turns tables on the student court and rallies the troops to revolt. Orson Welles argues against the death penalty for two notorious murderers. Reese Witherspoon’s persistence breaks an unreliable witness with bad hair. Groucho begs the court to return the spy Chico to the bosom of his family. Jesse Eisenberg gives the deposition more than they bargain for. Anthony Hopkins ridicules the argument that slavery is man’s natural state. Amid bickering and intransigence, foreman Martin Balsam and advertising exec Robert Webber propose a plan for breaking the early deadlock. There’s always one . . .